The student of European Knowledge (rangaku), Aoki Konyoo あおきこんよう【青木昆陽 1698～1769】from Satsuma studied the nutritious value of these potatoes and thus saved the people from starving during the Edo perod. He was therefore called "Doctor Sweet Potato", 'Master Sweet Potato' (kansho sensei) かんしょせんせい【甘藷先生】.
. Aoki Konyoo 青木昆陽 Memorial . a deep/fried crunchy snack, also sold in packets. sweet potatoes are cut into circles of about 1 cm thickness and dried in the sun (and hopefully some cold wind from the sea, as in Shodoshima, Kagawa). Since the rings of potatoes roll around koronkoron, the name was given to this food. The dry sweet potatoes are grind to flour in a stone grinder. The flour is used to prepare various dishes. This was a way to preserve the sweet potatoes for winter. In Shodoshima there is almost no rice grown and people used sweet potatoe dishes instead. The island was also called "Sweet potatoe island さつまいもの島". The skin is also used for making the flour and the final product looks slightly brown. 70% kankoro flour, 30% wheat flour is mixed. Dashi is made from iriko sardines. The noodles are eaten with a bit of ginger and spring onion cuts. They were formed by the mother with her hands only and showed the imprints of her fingers. The vine was also used as a toy for girls, they prepared earrings out of it by tearing about 6 small bits out of one vine, letting it hang on one thin fiber connected to the vine. After the war, anything was used to eat, so the vines of the sweet potatoes in this area were simmered with soy sauce and kombu. Today the tsukudani makers take pride in their work, using the best konbu from Rausu and Rishiri off Hokkaido and a special soy sauce (saishikomi) from the island. Just blending the ingredients for about two hours by hand in huge pots with a special ladle takes a few years to learn. 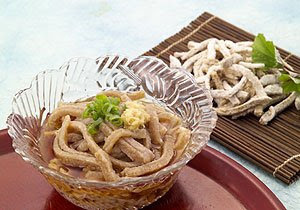 A special finely chopped tsukudani for children can be eaten with a raw egg on rice (tamagokake gohan　卵掛けご飯), a simple but delicious dish. Tsukudani is also served on toast on the island, with a bit of mayonaise or cheese: tsukudani toast　佃煮トースト. These mochi are not so hard and have a green color. yomogi or sesame was also added to the mix. They can be yellow or from purple satsumaimo. The potatoes are cooked and made to a mash in a suribachi, with a little dango flour added. Then salt and a lot of zarame raw suger is added to the imo dango 芋だんご. They are wrapped in leaves of sane no ha さねの葉, which have a faint fragrance of pepeprmint. The whole dumpling is then put into a SUME スメ, a hot steamer from the local underground hot steam of the Unagi onsen 鰻温泉　hot spring. 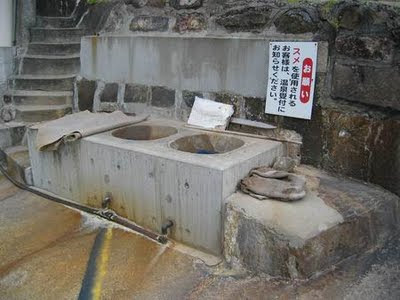 Each home has its own "sume steamer" outside, some even use the hot steam indoors as a kind of floor heating.
. . . CLICK here for Photos of Unagi Hotspring! The flat dumplings are enjoyed together with friends or neighbors, as a snack during field work and on the sekku festivals in Spring. It takes some time to prepare, but now even some schools are serving this to revive the local food traditions. "potato not to be eaten"
Found in Shikoku on Ashizuri Misaki, flowers in june/july. Has poison and can not be eaten. Maybe brought by currents from the lost continent Sundaland スンダランド. at temple 伊勢の菩提山（ぼだいせん）神宮寺. This temple has been founded by waka-poet and priest Saigyo, but has fallen to ruin when Basho visited. tororo potato, yama-imo, Dioscorea opposita, a kind of YAM.